When ordering a mouth guard that is truly custom fit, a dental impression of your teeth must be taken . Now, if you’re going through a dental office, a professional will take a nice, clear impression of your teeth. But if you decide to purchase online, you will get a kit sent to your home and the task will be yours. It’s not rocket science but it does take some prepping and familiarizing yourself with the process before you begin. 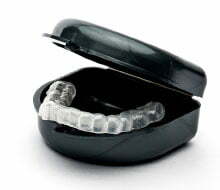 The fit of your mouth guard or night guard for teeth grinding depends on how well you take your dental impression. Here we will break the steps down to ensure that you take a perfect impression of your teeth for your new custom fit mouth guard. 2. Mixing putty (usually purple and white or blue and white) This putty is a base and a catalyst. When mixed together, it becomes hard after 1-5 minutes (depending on which type you get -fast set or slow set- set times differ). 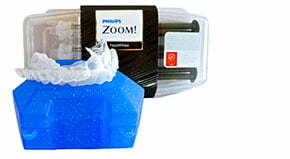 Sentinel Mouthguard’s impression putty has a working time of 40-60 seconds and a set time of 3 minutes. As stated above, the fit of your mouth guard depends on how well you take your dental impression. So it starts with you. Taking your own dental impression requires focus. Pay attention to the directions. Make sure you’ve set aside time so that you’re not rushed and can focus on the task at hand. Take several minutes to read through the instructions and make sure you feel comfortable with the process before you start tearing things open. There are several good youtube videos that are helpful. Brush your teeth. Clean teeth are essential for getting a clear impression of your teeth. Wash your hands. Don’t use gloves during the impression process. Just wash your hands and dry thoroughly before you begin. 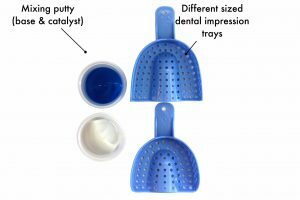 Some online mouth guard companies will give you a couple of different trays to try in. If this is the case, choose which tray fits best. It’s better to be a little too big than too small (you don’t want any of your teeth hitting the sides of the tray). If you’re having to stretch your lips a bit, try putting some chap stick or vaseline on them to avoid cracking. Practice putting the plastic tray in your mouth and taking it out. Your teeth should not be right up against the sides of the tray. Remember, you will be filling this tray with putty and submerging your teeth into the putty. So, you’re not going to want your teeth hitting the sides of the tray. Have A Timer Ready. Get Ready To Mix The Putty! The most common error that we see when attempting to take your own dental impression is letting the putty get hard before submerging the teeth. It is very important to pay attention to your time and work fast. Different brands and putty types have different “working” and “set” times. If the putty has a working time of 2 minutes (for instance) you must quickly mix, roll into a hot-dog like shape, place in the tray and submerge ALL the whites of your teeth within 2 minutes. The set time will be however long you must hold it in place once teeth are submerged in putty. As stated above, our impression putty has a 40-60 second “working” time (this is the time you are mixing the two puttys together, rolling into hot dog shape and placing in the tray). The set time is 3 minutes. Mix putty quickly and thoroughly, folding and kneading to get as much of the white blended into the purple as possible. Watch that clock! With the palms of your hands, roll into hotdog shape and place putty into tray. Place putty in the plastic tray. With your fingers, spread the material evenly (making sure to cover the sides of the tray). Make sure you press the putty filled tray into your teeth covering ALL of your whites. Do not bite down. Hold in place for however long is indicated on your instructions. After removing your dental impression, give it a quick water rinse and very gently pat dry. Place impression in your mailer and return to company. 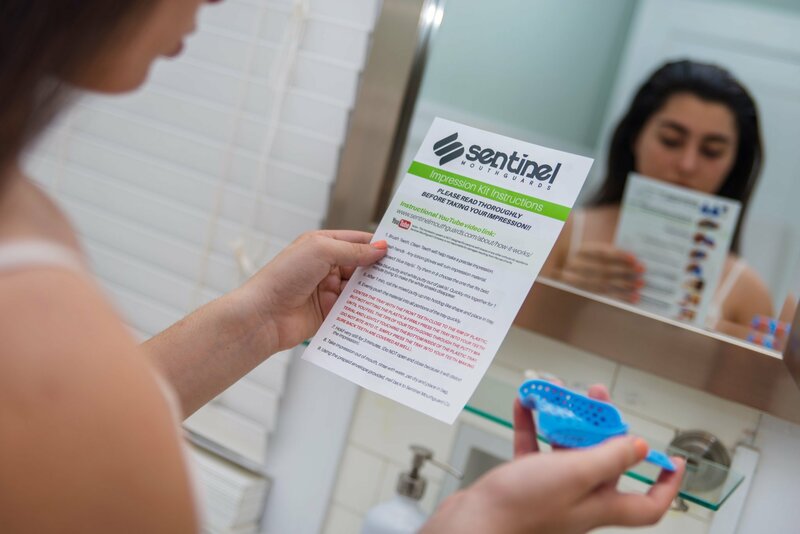 Here at Sentinel Mouth Guards, we supply one free redo kit if you mess up. Simply contact us to request your redo kit. 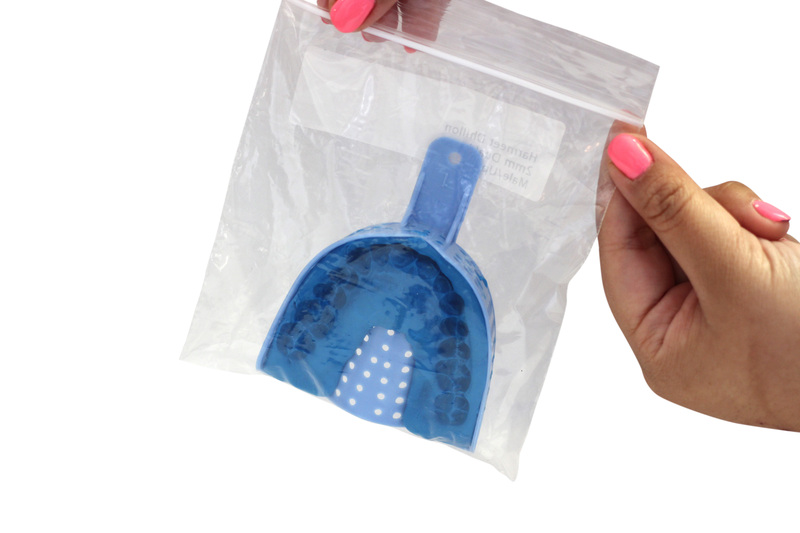 Remember to hang on to your prepaid mailer as you will be needing it to mail back your new dental impression. Not at all. We make night guards for all types of dental anatomy. No. Sentinel Mouth Guards is not liable for any damages resulting from the use of our putty system. If you have loose teeth or loose dental work, you will need to get those issues resolved before purchasing our product. Good, solid teeth are a must! We have a 90 day no questions asked return policy. You can return your impression kit for a full refund if you are within 90 days of purchase date. We use VPS regular set impression material. The working time is 2 minutes and the set time is 3 minutes. We hope you learned how to take your dental impression. 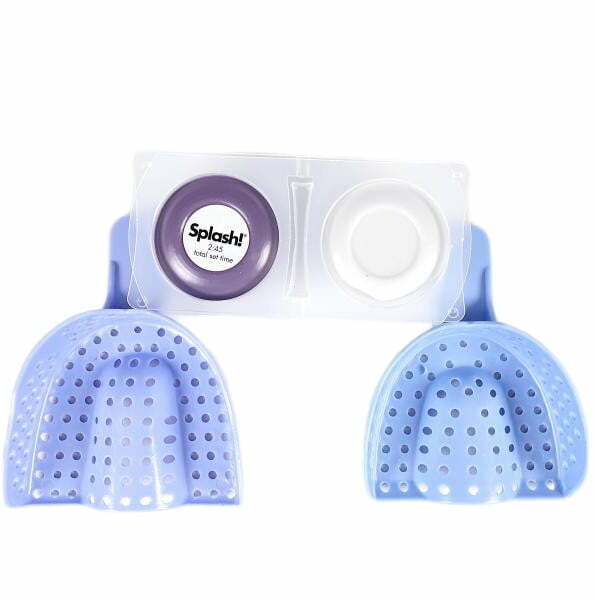 Taking your own dental impression is easy squeezy! Not to mention you save a lot of money by going through an online night guard or mouth guard lab vs. paying a dentist. Hope this helps you feel confident about taking your own teeth impression. If you have ANY additional questions or concerns please feel free to ask or express in the comments section below. Thanks!